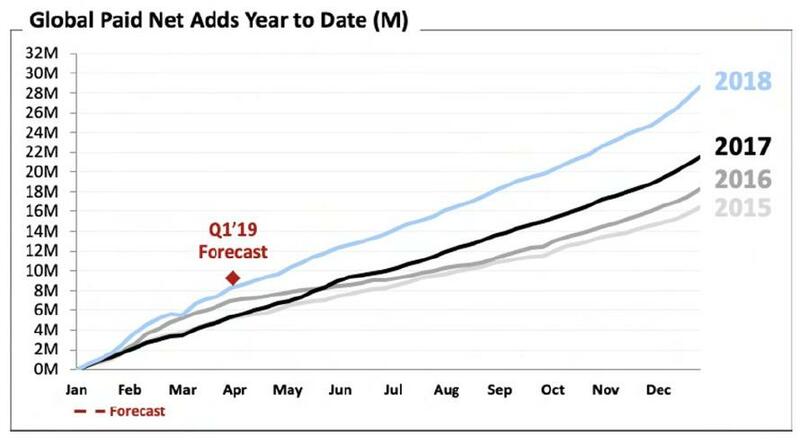 Last October, when Netflix reported stellar Q3 earnings and guidance there were many skeptics who said there is no way Netflix could possibly hit its impressive forecasts. 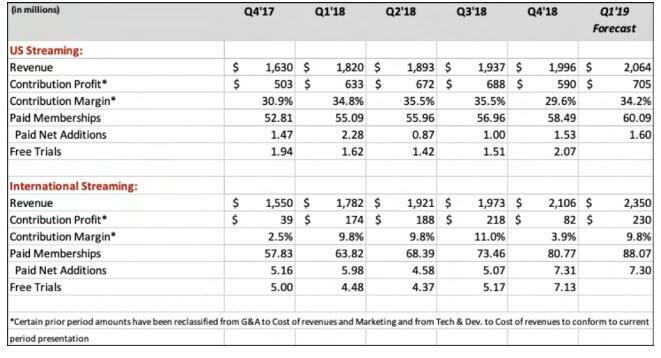 They were right, because moments ago the video streaming company reported Q4 earnings which missed on revenue and revealed light guidance for Q1 even as it reported strong subscriber numbers. Specifically, Q4 EPS was $0.30 (which included a $22MM non-cash gain on FX remeasurement of Euro-denominated debt), well below the $0.41 reported a year ago if slightly above consensus expectations of $0.24. Revenue of $4.187BN however came in light, missing expectations of $4.21 billion. The revenue miss, according to Bloomberg, "is a sign that all those new shows and movies that Netflix is churning out isn't drawing enough new paying subscribers." Looking ahead, Netflix reported that Q1 forecast revenue would be $4.494BN, which while 21% higher Y/Y is below the exp. $4.6BN, with EPS of $0.56 also missing consensus expectations of $0.94. Netflix also announced that Q4 operating margin dropped to 5.2% vs 7.5% a year ago due to "so many titles launching in the quarter." 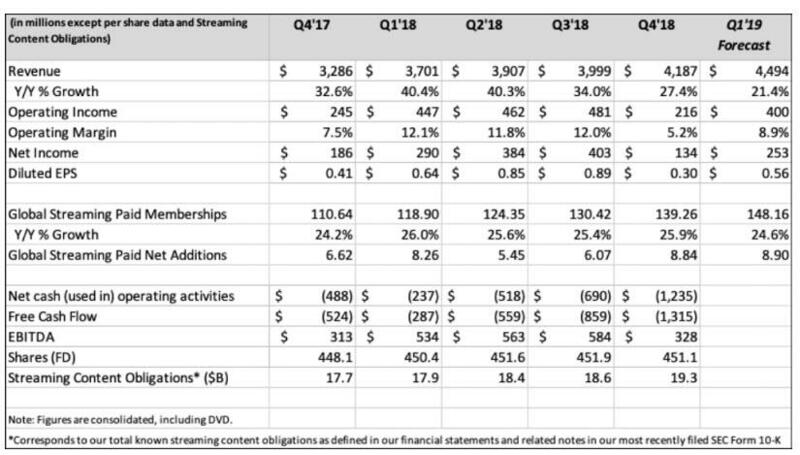 Perhaps more importantly the company reported a record 8.84 million paid net streaming additions, which while below the 9.40 million guidance from last quarter, is not apples to apples as starting this quarter the company is only reporting paying subs not total subs. That said the paid number was higher than the beginning of quarter expectation of 7.6MM paid subs. That said the number is an 8% increase from a year ago, and will largely be thanks to international subs, which were an addition of 7.31MM in the quarter, up from 5.07MM in Q3, while domestic paid subs rose 1.53MM, up from 1.00MM in Q3. Finally, for the full year, Netflix added 29MM new paid subs vs 22MM in 2017. 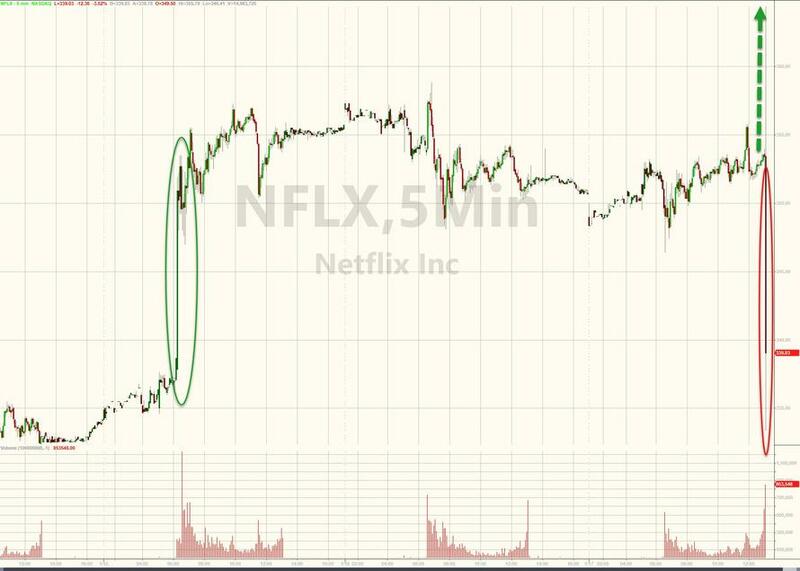 Which brings up the question - why did Netflix just announce a price hike, to which we bring up the answer provided by Anthony DiClemente who before earnings was worried that the market is "pricing in perfection" and wondered if the real story behind this week’s price increase is that the company sees revenue coming more from fee increases than subscriber growth. Considering the relatively light subscriber growth forecast for Q1 it appears he may have been right, and the risk is that the price increase alienates even more existing subs: "we wonder whether a somewhat challenging earnings setup just became a bit more difficult,'' DiClemente said. 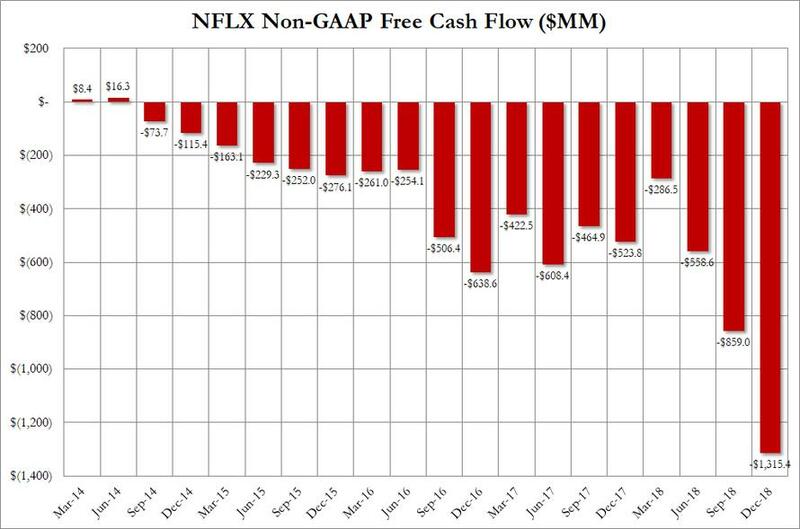 And then there was Netflix's Free Cash Flow, or rather Free Cash Inferno, which in Q4 nearly tripled from a year ago, when it was "only" $523.8MM, rising to $1.315 billion. In other words, Netflix burned $15 million in cash per day. Which leads to the next question: how much will Netflix spend on programming next year, While the company did not address this, it did say that Free Cash Flow in 2019 will be similar to 2018, when it burned $3 billion and says that "then it will improve each year thereafter." Netflix expects that cash burn will be reduced by "growing operating margin, which will allow us to fund more of out investment needs internally". For now, however, Netflix will continue selling junk bonds saying it will "finance our working capital needs through high yield market." The company finished the year with cash of $3.8 billion and its $500MM credit facility was undrawn. And so, unlike last quarter, and perhaps as a result of the torrid rally in recent weeks, the stock dropped after hours, and was down over 2% to $343.8 after hours.